The US-supported, Kurdish-led Syrian Democratic Forces said on Wednesday that they are close to the recapture of all of Raqqa city, the Islamic State’s main position in Syria. “We can say that 80 percent of the city of Raqqa has been liberated,” an SDF statement said. It claimed a new front against ISIS on the northern edge of the city as “a feature of the final stages of the Euphrates Wrath campaign, which is nearing its end”. An SDF media official said about 700 to 1,000 IS fighters remain in the city, with the US-backed fighters, led by the Kurdish militia YPG, facing a concentration of mines and wanting to avoid harm to civilians. The SDF, which has pushed back the Islamic State in north and northeast Syria since its formation in autumn 2015, entered Raqqa from the west and east in June, and soon moved into almost half of the city. However, in the past two months its advance has been slow against heavy Islamic State resistance. 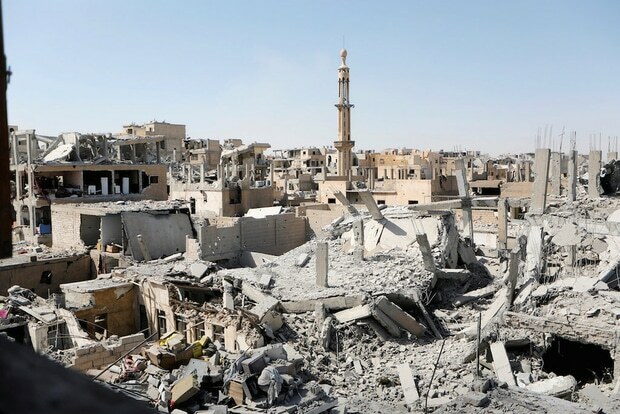 US artillery and airstrikes have destroyed much of the city and caused hundreds of civilian casualties since the SDF’s offensive in Raqqa Province began in March. About 20,000 civilians are estimated to remain in the city, which had a pre-war population of about 220,000. The monitor Airwars said in a Wednesday report at least 433 civilians were likely to have been killed in August by the supporting attacks by the US-led coalition, including 5,775 bombs, shells and missiles. Airwars director Chris Woods said, “More munitions were dropped on Raqqa in August than even during the heaviest fighting in west Mosul,” Iraq’s second city that was regained from the Islamic State in early July..
“And the effects on civilians trapped in the city have been equally devastating,” Woods summarized. The coalition says it has dropped at least 16,500 munitions in Raqqa and surrounding areas since June, but Woods said it has only acknowledged only four deaths from two incidents so far. In an e-mail statement to Al Jazeera on Wednesday, the coalition said its operations had killed 685 civilians in Iraq and Syria since 2014. Pro-opposition outlets report that Russia is continuing its escalation of airstrikes on Idlib Province in northwest Syria, defying Moscow’s own declaration of a “de-escalation zone” to hit civilians as well as rebel factions not involved in fighting with the Assad regime and its allies. The al-Dorar site says latest raids included the targeting of commanders of Suqour al-Sham and Ahrar al-Sham, even though the rebel groups are not involved in attacks which began Tuesday on regime positions in northern Hama Province. A senior official of Suqour al-Sham said the commanders were unhurt, but the strikes had caused casulaties. Al-Dorar says four members of one family died in an airstrike on the town of Jarjanaz. On Tuesday, as fighting surged in northern Hama, Russian and regime warplanes carried out more than 100 strikes on neighboring Idlib, including the destruction of three medical facilities, civil defense positions, and other civilian sites.